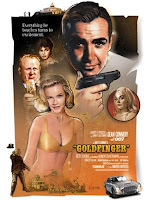 I saw 'Goldfinger' at Butlins in the summer of ‘66. A woman painted gold. Private jets. Quite a lot of kissing. And a man called Oddjob who sliced off people’s heads with his bowler hat. My sister and I blinked out of the cinema into the heat and light of an afternoon we’d forgotten was there. At eight and eleven, it was the first ‘grown-up’ film we’d seen and it was even more special to us because a welsh woman, Shirley Bassey, sang the title song. the theme: the obliteration of the world economy which in the light of current events didn’t even have a glimmer of fantasy about it. Eight years ago, over Christmas and New Year, we stayed on Hillsboro Beach, north of Fort Lauderdale on Florida’s Atlantic coast. Spike TV were running back to back Bond movies over two days, so on Christmas Day, while I alternately sipped champagne, roasted chicken and potatoes, read in the sun for stretches of 30 minutes, and thickened the gravy with pancake mix because I’d forgotten to buy flour, Tony lay back in the villa’s ‘massage’ leather arm chair, complete with remote control and adjustable foot and head-rests, dressed in a sarong, with a glass of Buck’s Fizz in his hand. ‘Where’s my woman?’ he’d holler when the commercials came on. The name’s Crosse, Tony Crosse. We always had turkey for Christmas when I was little. And sausage meat stuffing. We woke up to one of Dad’s big socks at the end of the bed, fat with little presents and a satsuma in the toe. Mammy put a threepenny bit in the home-made pudding. There were Selection Boxes, a tin of Quality Street, After Eights, mince pies. Dad drank beer. Mammy drank Harvey’s Bristol Cream and our sips progressed with the years to a half of a very small sherry glass with dinner. And we listened to the Queen. The five of us together. Ritual. Our lives need a sense of stability and belonging, moments or events when we feel connected to people or place. They don’t have to be rituals dictated by religion or society. They don’t have to contain any overt sense of ceremony. All they need is conscious thought to give them significance and a mood of celebration. At the end of November I’m flying back from France to Wales to see my family. When my great-nephew, Iwan, heard about my visit, his response was, ‘Straws and crisps?’ I am that woman! Even at three years old our impromptu parties with balloons and games (and ‘straws and crisps’) bind him to me. 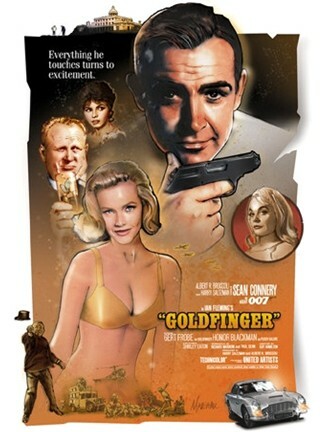 Connery’s early Bond movies have become a Christmas ritual. The holiday’s just not the same without James. And sausage meat stuffing. Make up the stuffing with 9 fl oz of boiling water. Skin the sausages and mix the flesh into the stuffing mix. Roll into 8 balls and put in an oiled oven-proof dish. Cook at 200° for about 35 minutes or until cooked through and crisp and golden on top. Write about a childhood Christmas and a Christmas from your adult life. Write about a ritual in your life, anything that repeats itself during the year, or from year to year.